For Ezra Kimondo, it was business as usual as he reported to work early in the morning at around 8.30am ready for his daily routine as the head of Customer Service at Brighter Monday on the fifth floor of Grosvenor building, in the Dusit complex. He had little inkling as to the events that would take place in a matter of hours and which would leave a permanent emotional and psychological scar on his life. He said that he had gone for lunch and resumed his duties when hell broke loose at around 3pm. "No one saw it coming. At around 3.30pm we heard a blast -- actually three bangs -- and it was suddenly chaotic. The gunfire was particularly intense near the exit, forcing us to come back to the building on the first floor," he said. He recounted how, after the gunfire became too much, they resorted to using WhatsApp and Twitter to communicate with their families. "The first person I texted was my father who told me to stay still until security officers arrived," he recounted. Eventually at about 3.20am on Wednesday, the security officers, who were moving floor by floor, reached them, identified themselves, and then got them out of their hideout. "There was no way of telling the identity of the attackers due to the confusion and heavy gunfire," he said. For Faith Chepchirchir, the sounds of explosions and gunshots amid plaintive wails are permanently etched in her mind. "We heard a loud bang in the adjacent building. It sounded like 10 tyres bursting at the same time. There was a lot of confusion as everyone tried to run towards the gate but we were forced back," said Ms Chepchirchir. She said they quickly closed the doors as the terrorists made their way to the top floor and started shooting. "We were hiding under the desk and chairs before police arrived. At first, we could not believe it and they had to identify themselves for us to feel safe enough to come out," she said. 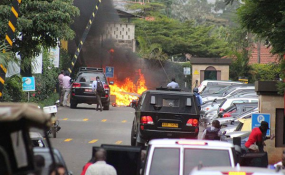 TV journalists Dickson Onyango and Sylas Apollo, both from NTV, were among the first survivors to emerge from the building as they recounted the harrowing tales of the 12 hours they spent hiding from the killers. Mr Apollo recounted how a normal interview with members of the Commission for Revenue Allocation (CRA) at their Grosvenor Suite offices in Riverside soon turned into an ordeal that he would want to forget quickly. He said that, after the ambush began, they were forced to cram into a toilet cubicle on the second floor of the building together with 15 other people. At least 50 other survivors made their way out of the building at about 4am after being rescued from the first floor of the office block.